Two 1/1 cottages PLUS insulated shop/storage building. Live in one, rent the other, or lease both. 306 E. Main is a bungalow with wood walls, exposed ceiling joists, covered porch, metal roof and picket-fenced front yard. 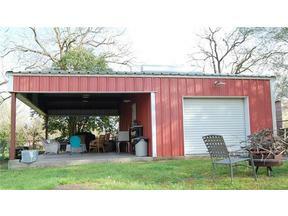 308 E. Main is an efficient 1/1 with a covered side porch/utility room and composition roof. The steel storage building offers roughly 450 sf of insulated storage plus 450 sf covered pavilion area. Mature pecan trees, city water/sewer, super location close to the store and post office. Property listed by Fayette Realty, Inc.